“What about the Eaglet?” the message read. Immediately Jay Philbrick knew what his friend was proposing. 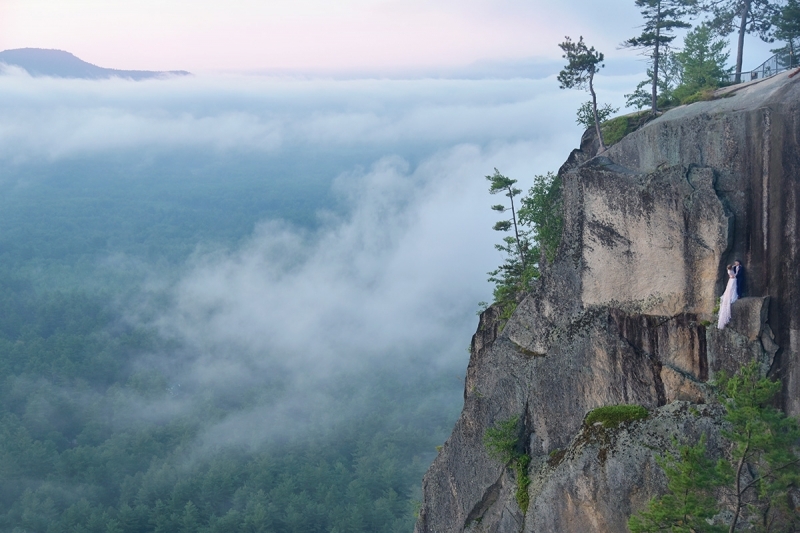 Most of Philbrick’s dramatic cliff portraits are set on New Hampshire’s Cathedral Ledge, a rock-faced cliff where subjects are lowered down to an outcrop by rope—no climbing skills required. But this friend was suggesting a portrait atop the Eaglet, a narrow rock spire that can be summited only by an experienced climber. Was Philbrick up for it? Of course, he responded to his friend. Was she? Ditto. 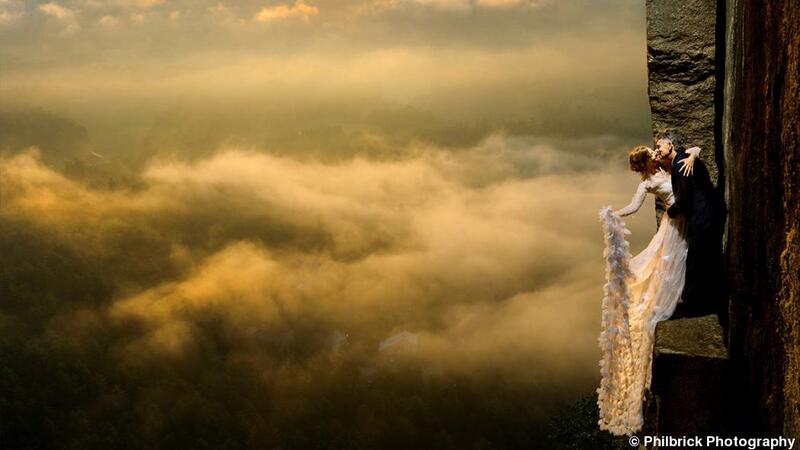 So Philbrick set out to make his most challenging portrait yet—of his friend in a parachute dress perched atop a free-standing rock spire. He began the process by assessing the spire with partner Marc Chauvin, a highly skilled guide who handles all of the rock climbing aspects of Philbrick’s cliff portrait sessions. “Unlike Cathedral Ledge where you step out of your car and you’re there, this involved a steep hike with no real established trail, just a climbers’ trail,” Philbrick says. The first time the duo set out they simply assessed the spire from below. The second time, they climbed it so Chauvin could gauge where he might position a system of anchors and ropes to hold the subject in place while she modeled for photographs. “We determined it was going to work,” Philbrick says. With Chauvin and subject nestled into their perch for the night, Philbrick slept at the base, waking up early the next morning to hike to a ridge that would serve as his base for making photographs as the sun rose. The trio communicated by walkie-talkie, with Philbrick making photos using a 200-500mm zoom lens he’d purchased for the session. A frigid wind made the session particularly uncomfortable for all involved but turned out to be a boon for the portraits, as the purple parachute dress whipped dramatically in the wind. “She looked like a butterfly,” Philbrick says, and like so many of his cliff portraits, the images and the behind-the-scenes shots went viral. Photographing subjects on rock walls is a natural fit for Philbrick, who worked as a climbing guide with Chauvin for many years before becoming a professional photographer. “Cathedral Ledge was my office back in those days,” he says. 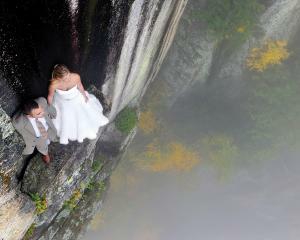 While doing wedding and portrait photography, he’d always had the idea to photograph a wedding couple on a ledge. 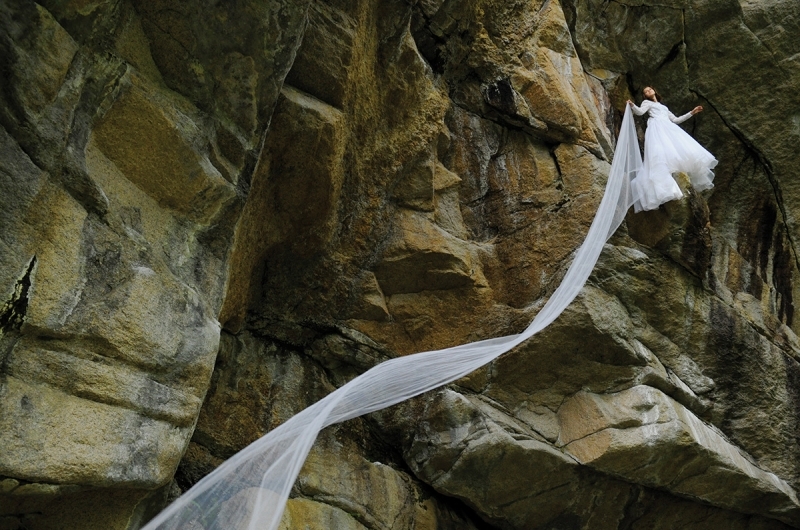 When one of his clients mentioned they were rock climbers, he proposed the concept for a day-after wedding session. “That was in 2008, and they were the only couple I’ve ever asked,” he says. After he made that photo and hung it on the wall of his studio, another wedding client couple pointed to it and said, “We want to out-do those guys.” Since then, he’s had a small and steady stream of adventurous clients who’ve reached out to schedule sessions. “Last year we did 10,” he says. Knowing that no insurance company would cover these sessions for Philbrick, clients sign a liability waiver as Chauvin’s clients, since he’s responsible for the climbing aspects of the session, and his mountain guiding business is covered for such risks. Philbrick’s only job is to make the photographs. Though the images give the appearance that subjects are standing on a ledge with no support, they’re always anchored into the rock face redundantly, with ropes and harnesses concealed by clothing and camera angles. 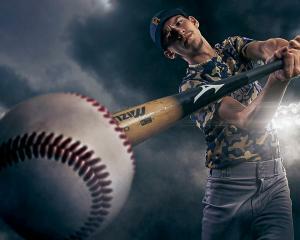 Philbrick never relies on Photoshop to remove equipment from photos. Hanging from a rope, he positions himself next to and slightly above his subjects for photographs and “Batmans” up and down the rock face when he needs to switch out equipment—various Nikon bodies, lenses from 14mm to 500mm, strobes, speedlights, a Phottix Indra500 TTL, and triggers. Meanwhile his wife, Vicki, also a climber, makes behind-the-scenes photos from a separate ledge or the cliff top. Philbrick makes the photos at sunrise for the light and also because it’s a less busy time at Cathedral Ledge. He always schedules the sessions on weekdays. “We don’t want people running up to the ledge [for a look], and we don’t want to create a circus atmosphere out of these sessions.” He also doesn’t need amateur photographers poaching shots. Subjects are lowered to the ledge at around 3:30 a.m. It takes about an hour for Chauvin to get them anchored and ready for photographs. Brides usually wear a white spandex top and tights so they can slip their wedding dress over their clothing once they’re anchored to the ledge. 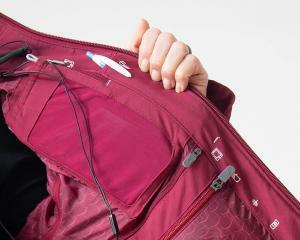 Chauvin cuts a hole in the back of the dress where the waist harness rope connects to the rock anchor. When everyone is in place, Philbrick has 30 minutes to capture images of the couple before sunrise as the sky brightens and the light hits the granite rock. “We have some red sunrises, and if we are really lucky we have valley fog down below.” When needed, Chauvin holds a strobe on the other side of the couple to balance the light. All told, the client experience lasts about two hours. Philbrick’s cliff sessions are not in themselves a significant part of his overall revenue. He charges $1,500 per session (with clients paying Chauvin an additional $350) and may book just 10 in a year. “But it’s made our business,” he says. Photos and behind-the-scenes shots posted online often go viral, leading to local and national television spots and stories in international media. 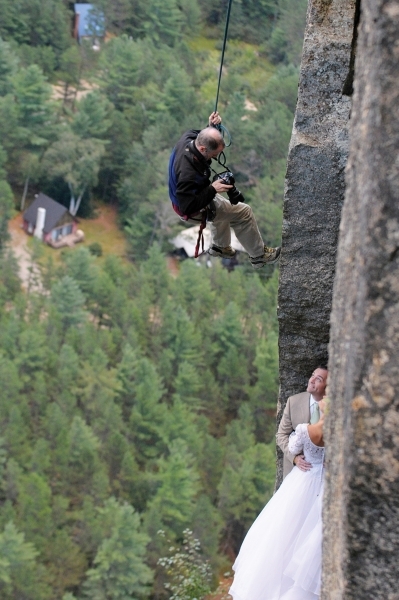 Many couples who contact him for wedding photography have no interest in a Cathedral Ledge portrait. “They’ll say, We don’t have to go out to the side of a cliff, do we?” But with such dramatic work in his portfolio, they’re confident Philbrick will come up with something amazing for their wedding. For many years Philbrick was reticent to market Cathedral Ledge portraits online. 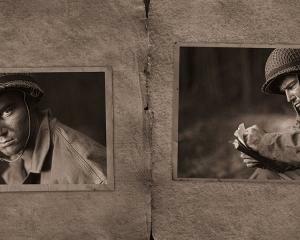 But in 2015, after a spot ran on the local news, he shared a few of the portraits and behind-the-scenes shots on a Facebook group page for photographers. “It went nuts,” he says, “with tens of thousands of likes and crazy comments.” The discussion became so heated—some commenters argued that Philbrick had put his clients in danger and others speculated that the images were Photoshopped—that the moderator asked Philbrick to stop sharing the photos. But the cat was out of the bag. A deluge of inquiries from major media outlets—Huffington Post, Cosmopolitan, ABC News—flooded in. “Eventually it got to the point where I actually had two phones to my head,” he says. When an agent called to see if he could represent Philbrick, he happily accepted the offer. He now has a worldwide agent who makes sure Philbrick gets paid for the use of his photographs outside the United States, taking a percentage of those earnings. It’s not incredibly lucrative. “It’s in the thousands, not the hundreds of thousands,” he says. But it trickles in every month, and it’s all the marketing he’ll ever need.